Digi-Schlock: TROLL/TROLL 2 (Scream Factory Blu-Ray) – Schlockmania! One of the more delightful double bills of the old MGM Midnight Movies line – at least for children of the ’80s – was their double-feature disc of Troll and Troll 2. The first film is a cult favorite from the Empire Pictures library while the in-name-only sequel has been recognized in recent times as one of the new bad movie classics. Scream Factory has revived this double bill in HD form via a new blu-ray that not only offers both films for one price but also throws in a few interesting extras. A/V presentation is solid for both films here, offering good levels of color and clarity for a two-films-on-one-disc presentation. Both films have 2.0 lossless stereo soundtracks and they offer quality presentations of fairly straightforward vintage mixes, with the DTS treatment giving a little extra punch to the music in each. Original trailers are included for each film, both of them suitably wild (especially the Troll 2 trailer), plus a nice little image gallery for Troll. Each film also gets its own unique large-scale extra. In the case of Troll, its a 50-minute making of featurette that goes deep into the film’s history and involves director John Buechler, writer Ed Naha, executive producer Charles Band and scores of FX artists including Gino Crognale and John Vulich. The featurette covers a lot of interesting ground for fans: you’ll learn how and why Empire ended up shooting Troll in Italy, how Buechler successfully pitched the idea to Band after years of struggling to get it made, a neat story about how Phil Fondacaro was cast, Richard Band talking about his score’s central “troll song” and a ton of information about the makeup effects and the old-school optical and stop-motion effects. A ny monster kids who grew up watching Troll will appreciate all the detail and love its genesis gets in this expansive featurette. Troll 2 gets a new commentary from its stars George Hardy and Deborah Reed, which sounds like it was cut together from separate recording sessions. Hardy is a real booster for the film, speaking enthusiastically about which sequences go over well with the film’s cult following and offering biographical info on most of his castmates. 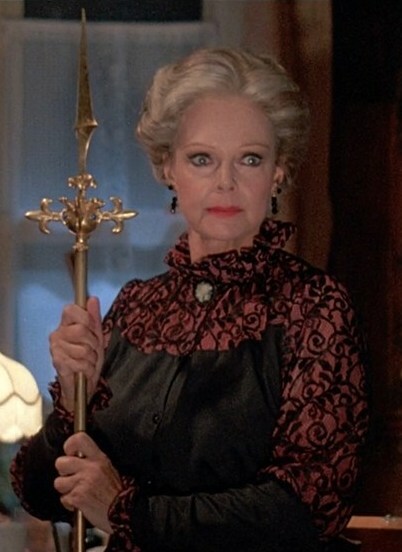 Reed offers a lot of detail about her scenes, including the challenges of shooting the infamous popcorn scene and how she put together her own costume using family heirlooms. Both express a genuine gratitude for the experience and the late-period fame it has brought them. 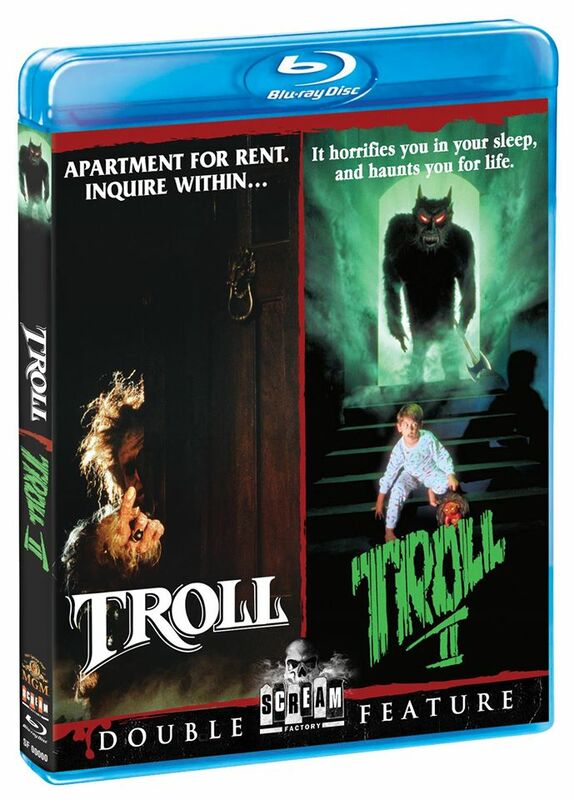 If you move fast and purchase one of the first 5000 copies of this blu-ray, you get an additional bonus: a free DVD of Best Worst Movie, the acclaimed documentary about Troll 2. It’s one of the best documents of a cult movie ever, chronicling the film’s development as a cult movie attraction and the effect it has on the film’s cast and crew members, most of whom have tried to forget it. Along the way, it shows how all the people behind the film struggle with their participation in an ironically celebrated film, appreciating the fame but having to deal how it both revives and casts aspersion on their desire to work in the arts. It’s a must-see for any cult movie fan and a great bonus for those who move fast enough to get one of these early copies. In short, Scream Factory has created a nice little update for a pair of linked cult favorites. Whether or not you get the version with Best Worst Movie included, this set offers a worthy upgrade for these films. To read Schlockmmania’s film review of Troll, click here. To read Schlockmmania’s film review of Troll 2, click here. Schlock-Wire: Andy Copp Unleashes THE MUTILATION MAN On Limited Edition VHS!